Before the close of the 18th century, the erosive capabilities of running water were not appreciated. Streams were believed to flow in valleys because the valleys were already there, not because the stream cut the valley. Catastrophism, with its emphasis on the biblical flood as the final stage in the shaping of the earth's surface, obviously influenced this perspective (Morisawa 1968). By the late 1700s, however, geologists reasoned that the dendritic pattern of drainage nets gave evidence of erosion, as did the observation that valleys in headwaters are smaller than valleys downriver. Modern study of geomorphology focuses on the linkages among channel, floodplain, network, and catchment, and employs such diverse approaches as strati-graphic analyses, experimental studies of sediment transport in flumes, modeling of physical processes, comparisons of landforms, and sophisticated statistical approaches to gain greater understanding of the physical dynamics of river systems (Kondolf and Piegay 2003). The field of fluvial geomorphology is the study of landforms generally, but in particular the study of river channels and drainage networks, emphasizing the dynamic interplay between rivers and landscapes. This chapter summarizes some of the main ideas of this field; readers wishing more depth should consult the books of Leopold et al. (1964), Leopold (1994), Kondolf and Piegay (2003), and Gordon et al. (2004). Fluvial geomorphology is important to stream ecologists for several reasons. It helps make sense of the enormous variety of rivers and streams introduced in Chapter 1, revealing how stream channels are shaped and suggesting useful ways to classify stream types. Variability in riverine features over space and time is responsible for the diverse range of habitats in which organisms live. In addition, quantification of the relationships among river features and analysis of the underlying processes contribute to a deeper understanding of how rivers and riverine habitats change in response to environmental influences, both natural and anthropogenic. This knowledge can in turn be used to avoid unwise management choices and inform the design of healthier rivers in anthropogenic landscapes. A central theme in fluvial geomorphology is that alluvial rivers determine the location and shape of their channels through complex interactions among hydrology, geology, topography, and vegetation (Leopold et al. 1964, Richards 1982). The development of stream channels and entire drainage networks, and the existence of various regular patterns in the shape of channels, indicate that rivers are in dynamic equilibrium between erosion and deposition, and governed by common hydraulic processes. However, because channel geometry is three dimensional with a long profile, a cross section, and a plan view (what one would see from the air), and because these mutually adjust over a timescale of years to centuries, cause and effect are difficult to establish. Leopold and Maddock (1953) argue that discharge, sediment load, and the elevational extent of the stream are extrinsic variables that the river cannot control, and therefore must adjust to. For a particular reach, slope exerts significant control over channel characteristics because it adjusts more slowly than other variables including channel width and depth, velocity, grain size of sediment load, bed roughness, and the degree of sinuosity and braiding. In concept, the mutual adjustment of these variables results in a graded stream, one whose shape exhibits a balance between its transporting capacity and the sediment load available to it. In reality, changing climatic and other factors may prevent a reach from achieving or remaining in such an ideal state for a long time. The usefulness of this concept lies in the fact that streams tend to respond to perturbation by moving in the direction of some equilibrium state. We begin by describing the shape and form of rivers - along their length, as seen from above, and as viewed across the channel and the valley. Rivers exhibit a number of remarkably predictable relationships among key hydrologic and geometric variables, and we will explore the underlying processes that account for these patterns. The central idea guiding this chapter is that streams seek a state of dynamic equilibrium, which is a function of the flow and sediment associated with a main channel and a flood-prone area (Leopold et al. 1964). 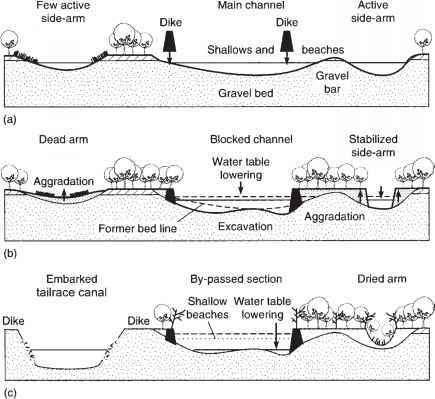 Stream channels tend to develop a stable dimension, pattern, and profile, features that are maintained in the face of episodes of high flows, sediment transport, and channel movement, and so it is the relationships that are predictable even though particular channel features may change. We begin by describing the patterns in channel shape, and later consider the processes responsible for these patterns.